NEGOTIATIONS ON THE formation of a government between Fine Gael and Fianna Fáil have not yet begun, but it’s now clear that Irish Water and water charges will be a key issue in those talks. Water has remained front and centre of the political agenda for much of the last two years. This is despite the outgoing government’s best efforts to dampen considerable public anger by introducing a capped charges regime until 2019. Along with the charges, the messy establishment of Irish Water ignited public anger and several opposition parties, including Fianna Fáil, went to the country in February on the promise of scrapping the troubled utility and getting rid of charges. The 32nd Dáil is considerably fragmented, but close to a majority of TDs in it are in favour of abolishing charges. Since the election there’s been an as yet unquantifiable drop in the number of people paying their Irish Water bills. Ironically, water charges have not been a huge issue in the more than 50 hours of talks that Fine Gael have held with over a dozen independent TDs in the last few weeks about the formation of a government. This is primarily due to many of these independent deputies being based in rural Ireland where group water schemes and private wells – which all cost money – are the norm. Now, with the widespread expectation that Fine Gael and Fianna Fáil must talk in order for one or the other or both to govern, there is sure to be significant focus on the water issue. So where what’s likely to happen? Fine Gael’s position has been reasonably clear when it comes Irish Water and charges. Agriculture Minister Simon Coveney caused considerable furore within the party in the immediate aftermath of the election when he suggested that water could be on the table in an RTÉ Prime Time interview. Backbenchers fumed over Coveney’s comments given that they had defended the existing water regime on the doorsteps during the election and in the months prior to that, despite a considerable public backlash. Coveney later clarified his remarks and since then the party’s position has been consistent or, as a spokesperson said today, Fine Gael’s position is “clear and will not change”. The retention of a single utility to manage our water services and the principle that people should make a fair contribution for water is the right thing to do for the country and our future. The difference with Fianna Fáil? It is Fianna Fáil’s stance that will prove to be difficult when Enda Kenny, Micheál Martin and their respective negotiators start engaging on policies. Fianna Fáil’s election manifesto said that “people should not be expected to pay for a service that is not up to standard”. It pledged to end the water charges regime and abolish Irish Water, replacing it with a “slimmed down agency” to deliver a national water investment programme. The provision of water services would be handed back to local authorities. The legality of getting rid of charges has been questioned, but Fianna Fáil and Sinn Féin maintain that it can be done. We explored this issue in more detail in a FactCheck article in February. In various public comments, Fianna Fáil figures have acknowledged that people would eventually be expected to pay for water. After all, it was Fianna Fáil that proposed the idea of charging for water back in 2010 when it reached an understanding with the Troika as part of the bailout deal. Read more: What’s the Fianna Fáil alternative to Irish Water and water charges? Since the election there have been suggestions that Fianna Fáil is rowing back from its position. Cowen was reported to have said that abolition of Irish Water and scrapping of charges would be “a red line” in any government negotiations. However, that phrase has not been used by the leadership or TDs since. That said, Fianna Fáil is currently drafting a bill to abolish Irish Water and suspend charges for five years, significantly upping the ante ahead of talks with Fine Gael. Speaking on RTÉ’s News at One earlier today, transport spokesperson Timmy Dooley said the bill would end charges once it is enacted. On whether his party, in government, would pursue those who have not paid their bills, Dooley was decidedly uncertain. But he did say that that unpaid bills are “still owing”. He also said that redundancy plans would be put in place for Irish Water staff deemed “surplus to requirements”, while some staff would return to their previous positions in local authorities. You can read more on that here. Dooley said there would be an “overarching entity”, based on the structure of the National Roads Authority (NRA), that would prioritise investment in water. This entity would be a lot smaller and, theoretically, less costly than Irish Water. Fianna Fáil’s drafting of a bill and restatement of its desire to abolish Irish Water and suspend charges is the party clearly outlining its opening position ahead of talks with Fine Gael. Fine Gael has done likewise, restating its own view that that the retention of a single utility and the principle of people making “a fair contribution for water” is the right to do. But, read between the lines and there are things that the two parties could potentially agree on when it comes to water. For example, both agree on the idea of a single national entity for water. Fine Gael thinks it should be Irish Water, Fianna Fáil thinks it should be a smaller, NRA-like body. In addition, both also believe in fairness. Fianna Fáil made a big issue of fairness in its election campaign, while Fine Gael talks about “a fair contribution” for water. When the real talking between the two parties begins, negotiators from both sides would do well to focus on these two areas in order to find a compromise on the contentious water issue. If they can do that then it may go someway towards finally getting the country a government. 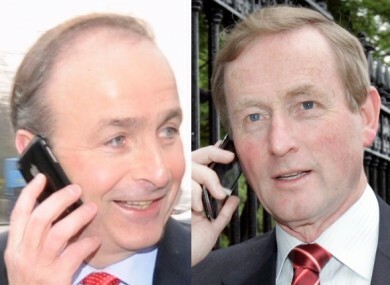 Email “How these two could resolve their differences over Irish Water and water charges”. Feedback on “How these two could resolve their differences over Irish Water and water charges”.